The North Unst Lighthouse, or as it is now known, Muckle Flugga Lighthouse, was one of the few lighthouses in Scotland which had a separate shore station that served as accommodation for the lighthouse keepers when they were off duty. Three Light Keepers would be on duty at any one time, and the others would be on shore leave. In the census returns for Unst, you can see the Light Keepers recorded in the census at the Lighthouse, and their families recorded in the shore station. Except that is for 1861. In 1861, the Light Keepers are all recorded as living with their families in the shore station, and there is no record of anyone at the Lighthouse. Now 1861 is some 134 years before the Lighthouse was automated in 1995, so there were definitely Light Keepers on site. Perhaps instead the problem was that this was the first census since the Lighthouse was built. It was first lit on 1 January 1858, so perhaps the enumerator simply wasn’t familiar with how he was supposed to record the keepers. 15 May 1862. Messrs Stevenson Engineers state 3 Lightkeepers were on the Lighthouse which is on the Island of Muckle Flugga. The ??????? with wives & famililes on Unst. I’m not quite able to decipher all the words in the last sentence so an image is shown below if any of you can decipher it. However, you get the gist of it. They weren’t where the enumerator said they were! I do love a good puzzle, especially when you find the last little piece of the puzzle fits in perfectly and proves all your remaining outstanding questions. I was actually following the branch of an Unst gent, Charles Peterson who, like many Shetland men, had moved to Toxteth Park to work in the docks. I found two possible marriage records for him, which upon further digging both turned out to be him as his first wife died not long after they married, as he is then recorded as a widower in the census and then in the second marriage record. As I always do, I like to branch out sideways in the tree and find out what I can about spouses, siblings etc. But I didn’t really know very much at all about his first wife Jemima. I had an approximate age, and her father’s name Peter Georgeson, from the marriage record. I had a Jemima Georgeson, born in Fetlar (the neighbouring island to Unst), with Unst ties in my tree, with the same approximate birthdate and father’s name. Could it be the same woman? I didn’t even know if Charles’ first wife was from Shetland, although it was certainly a common occurrence for two Shetlanders to meet in Toxteth Park and marry, I’d seen that many times already. If she was the same woman, then I wouldn’t find any evidence of her in the census in Toxteth Park because she was in Unst in 1881, and had died before 1891. 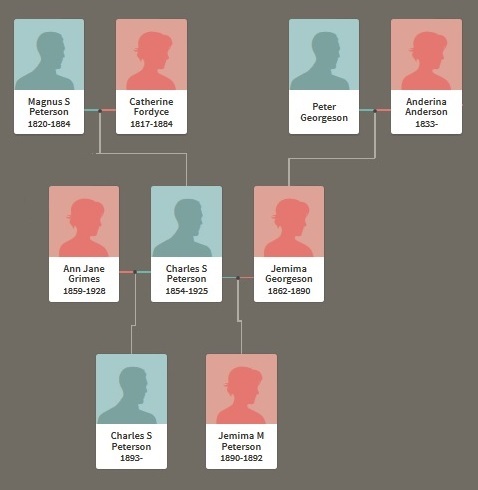 Then I found that she and Charles had a daughter, born in the same registration quarter that she died – suggesting a childbirth related reason for her death. This daughter died in Shetland in 1892. She wasn’t with her father in the 1891 census as he was on his own as a boarder. She must be somewhere in the 1891 census, perhaps she was already in Shetland by then, sent home by her widowed father to be looked after by relatives? Sure enough I located her in Fetlar, living with her grandmother, her maternal grandmother. That link proved that Jemima Georgeson was indeed the one I already knew of. Also, the census showed that little Jemima Margaret Peterson was 4 months old in the 1891 census narrowing down her birth date from a registration quarter to a month, and also the same for her mother’s death date. I just wrote a guest blog post over at the Society for One-Place Studies, all about the Doctors in Unst in the late 1800s. Transcribed records, provided by the various online genealogy websites are all very well, but part of your research should include checking the actual record image as well. For English records you may well be lucky enough to do this at the same time, and on the same website as the transcribed version, but for Scottish records you have to get them separately from Scotland’s People. I had a recent person I was looking into that illustrated, again, to me, that it’s always important to look at the real records. This lady was recorded as living in a house called Garden, in both the 1901 and 1911 census, and the transcription of the 1901 census said she was born in “North Unst”. That was in itself slightly unusual because most people recorded in Unst census returns have their place of birth recorded simply as “Unst”, without it being broken down any further. This is in contrast to the neighbouring island of Yell where birth places are broken down into “North Yell”, “Mid Yell” and “South Yell” because the island itself is not a single parish, and thus not a single registration area, unlike Unst which is. When I found this lady’s birth record, it showed she was born in Garden, Unst. Not a surprise since this is where her parents, and later she, also lived. Now there are two houses called Garden in Unst, one in Colvadale, and one in Snarravoe, neither of which I would consider to be in North Unst! See map for the two locations. So, I brought up the actual 1901 census record, and it doesn’t say North Unst at all! It just says Unst. It would seem that the transcriber’s eye has been pulled offline to the record below her which records someone born in “North Yell”. So, remember it’s always worth checking! Looking through the Statutory Death Records for Unst today, I came across this record. Normally the age of the deceased is recorded just with a number of years, except in the case of infant deaths which haven’t made it to one full year yet. I get the impression in this case that her grand-nephew wanted to make sure it was known how close to 100 years she achieved. While she and her family and friends may have celebrated had she reached 100, the telegrams from the monarch to congratulate a centenarian didn’t begin until 1917. Elizabeth was born before the days of statutory birth records, so the only record of her early life is a baptism record for 10 Aug 1802. With this detailed age on her death record however, we can calculate her exact birth date to be 1 Mar 1799.